Their surreal style has been described as darkly humorous, Brechtian, gypsy cabaret. With minimal musical accompaniment, , you will never hear another band like The Tiger Lilies. They bring to style their music, a truly unique sense, of humor , vulgarity, cynicism, with lyrics laden with dark despair. I think few bands can produce a musical feel that so well matches the mood expressed in the lyrics. Each year we can expect at least one awesome record from those crazy Englishmen , sometimes stellar, at other times just plain fun, and not missing when disappointed in one way or another, but in any case, I can´t say that there is only one Tiger Lillies album that not worth listening to. 16 Songs of crime and punishment. The Tiger Lillies were commissioned to create a song cycle of crime for the 17th Biennale of Sydney in May 2010. Here we present to you a collection of some of the darkest songs we have ever made, stories of societies most vilified and despised individuals stating there case for the world to judge. A former prison and shipyard, Cockatoo Island retains many remnants of its past. Its prison buildings have been nominated for World Heritage listing, along with other convict sites around Australia. Crimes against humanity, beast and God, terrible acts that arouse fury and confusion in the public at large. From the mundane to the horrific. Tried and convicted they may be, but what drove them to these acts? Can any of us ever say we have not harbored some violent impulse that we nearly acted upon? 80 minutes, lyric booklet included and colour gate-fold sleeve. Recorded at Mission Hall Studios, Edinburgh, Scotland, mixed and mastered by James Locke. Madness, murder, whores, soldiers and….peas. 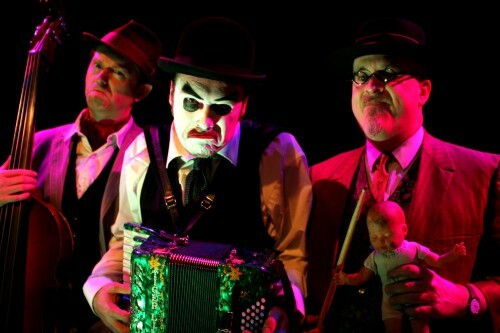 The Tiger Lillies tell the story of Franz Woyzeck, a lowly soldier stationed in a provincial German town. His wife is cheating, his superior officers consider him less than human and his doctor is performing medical experiments on him. He begins to experience a series of apocalyptic visions while his jealous suspicions grow. Things do not end well. Woyzeck is a stage play written by Georg Büchner in 1836. He left the work incomplete at his death, but it has been variously and posthumously “finished” by a variety of authors, editors and translators. Woyzeck has become one of the most performed and influential plays in the German theatre repertory. The production of Woyzeck and the Tiger Lilies was performed in Vienna 24 September – 15 October 2011 and this cd features the songs from the show. Recorded with Christian Kolonovits and a 10 piece brass band, the 12 songs follow Woyzecks descent into madness. and please use pay using PayPal at sophieseashell@gmail.com. Chris is let you know how much the cds and shipping will be. Click on albums below to familiarize yourself with the music the Tiger Lillies have put out for the world to bear. Buy CDs direct from the SHOP or by clicking BUY NOW. We ship worldwide and accept PayPal and all major Credit Cards.